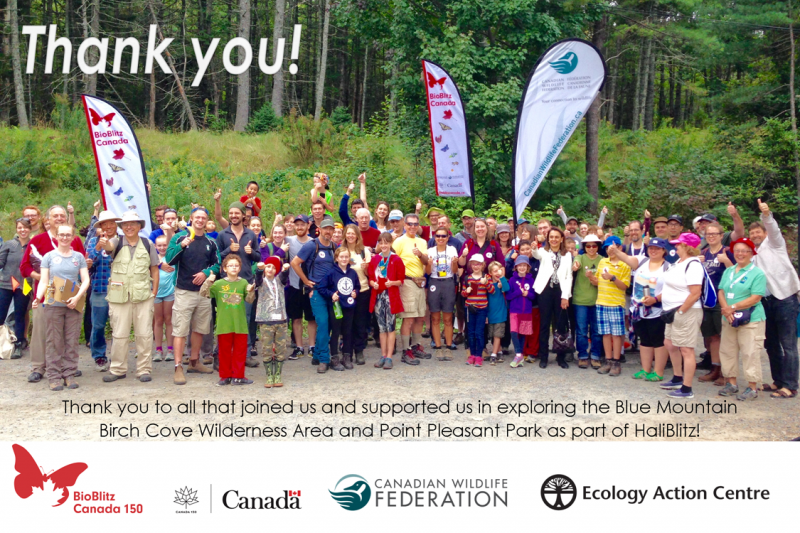 Thank you for joining us at HaliBlitz - a Halifax BioBlitz 150 event! 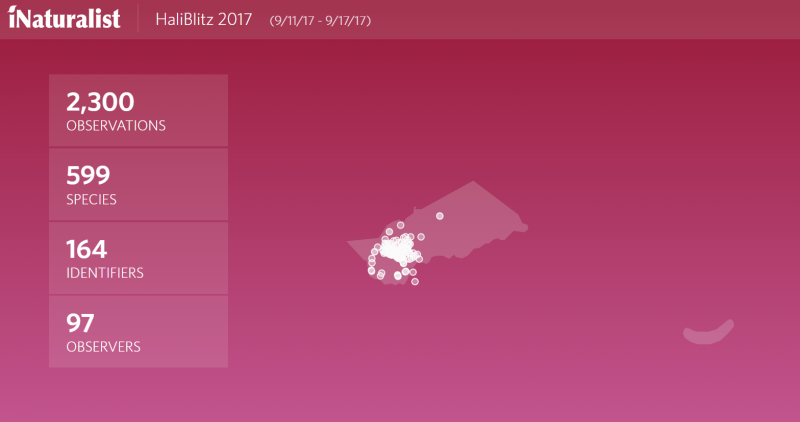 Over 600 people joined forces to explore parks, protected areas, and other nature spaces in Halifax as part of HaliBlitz – a week-long celebration of local biodiversity in September 2017. Protected areas are essential in an urban environment like Halifax to conserve species habitat and allow us to observe and connect with nature. HaliBlitz events followed leave-no-trace principles, and used photos to record species observations on site with the help of iNaturalist.ca. Through iNaturalist, anyone can take a photo or sound recording of what they observe in nature, and a global community will help to identify the species observed. The Ecology Action Centre and Canadian Wildlife Federation hosted this event with the support of the Government of Canada. 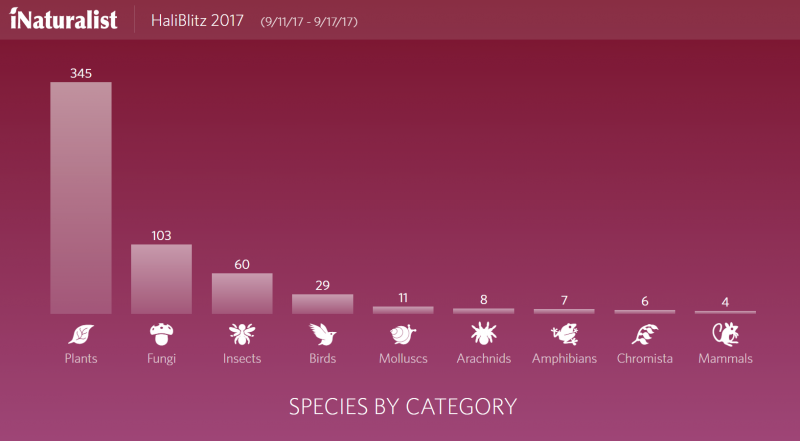 HaliBlitz was part of a national movement to inventory species. This inventory helps inform conservation decisions to protect wildlife habitat, and choices related to climate change and loss of biodiversity. 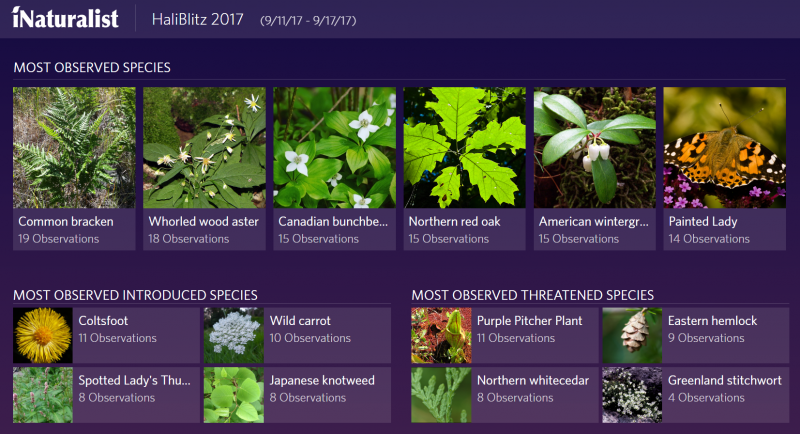 While HaliBlitz provided a snapshot view of what lives in Point Pleasant Park, Blue Mountain Birch Cove Lakes, and other nature sites in Halifax, the diversity in these spaces changes with the seasons and with time. All are encouraged to use the iNaturalist platform to continue making observations while exploring nature around us. All of our species observations were recorded on iNaturalist and contribute to the world's largest nature database! New to iNaturalist? Check out how to get started!